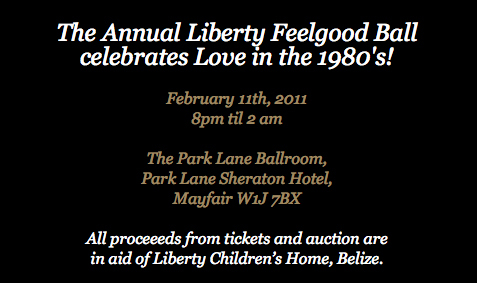 For those of us who can’t make it to the sunny, restorative and, frankly, life enhancing climes of Belize this winter, we can make ourselves feel good by attending the Annual Liberty Feelgood Ball in London’s Park Lane Ballroom. AB are big supporters of Liberty Children’s Home and are happy to take up any excuse to roll up our sleeves, don some busting shoulder pads and groove the night away to some 80s favourites. There’ll be great auction, including a week at our very own Solaria I, so do come along if you can. Tickets are available here. AB hopes to see you there.